The Japan Water Prize Committee announced on April 5, 2013, the winners of the 2013 Stockholm Junior Water Prize of Japan (Japan SWJP). The grand prize went to the Geography and History Club of Sanyo Joshi (girls) Senior High School in Okayama Prefecture, for their project, entitled "Toward Solving the Seabed Litter Issue in the Seto Inland Sea: a Trash Collection and Awareness-Raising Approach." The school will participate in the international competition to be held in September 2013 in Stockholm, Sweden. 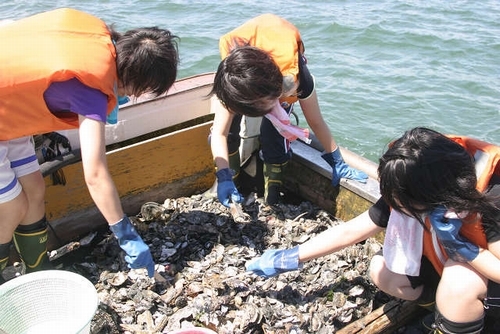 The high school's Geography and History Club is collaborating with the affiliated junior high school to tackle the serious problem of seafloor waste in the Seto Inland Sea to restore the beauty of the ocean. The students are collecting seabed litter and working to curb additional waste accumulation by raising awareness about the problem. The JFS Newsletter from March 2013 introduces the details of the students' activities. Japan SWJP is recognized as the national competition to nominate a Japanese representative for the Stockholm Junior Water Prize (SWJP), a junior version of the Stockholm Water Prize described as the Nobel Water Prize. The SWJP is awarded to young researchers who conduct outstanding projects (research) that contribute to improving people's well-being and aquatic-environment ecosystems.